Even though rhubarb is considered a vegetable, it is most often treated as a fruit. Rhubarb provides a good source of vitamin C, fiber, and calcium. It is usually eaten cooked, and just like fresh cranberries, rhubarb is almost unbearably tart on its own. It needs the added sweetness of sugar, honey, or fruit juice to balance out the acidity. Since rhubarb is primarily used for pie, it is also referred to by it’s nickname the "pie plant". Mom's Rhubarb Pie Recipe 1 1/2 Cups of Sugar 1/4 Cup of Flour 1 Teaspoon of nutmeg 3 eggs 1 pound of rhubarb Mix together sugar, flour and nutmeg until no lumps of flour remain. Add eggs and stir until smooth. Slice rhubarb into 1 inch pieces and add those to mixture; stir until well coated. Fill 9 inch unbaked pastry shell filling and cover with lattice crust. Bake at 400 degrees for 50 minutes. Pastry Crust: 2 cups of flour, 2/3 cup of butter or shortening, about 1/3 cup of cold water. Chop cold butter or shortening into flour until pea-sized lumps form; add cold water and mix until cohesive enough to be rolled. When ordering keep in mind that if you want the rhubarb to arrive frozen you need to choose an overnight or 1 day shipping option. If you choose another shipping option the Rhubarb will thaw some, but can be re-froze when your receive it. Each 5 Lb. 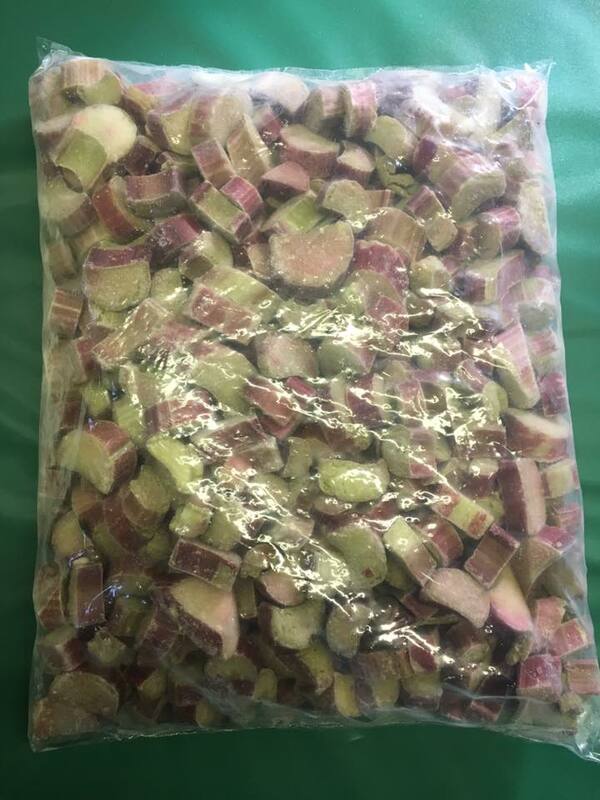 bag of rhubarb is packed in it's own Styrofoam cooler with a large gel ice pack and then placed into a cardboard box for shipping. We ship Monday and Wednesday of every week all year long. Keep in mind when ordering that there is always less thawing in the fall & winter months than in the summer months.